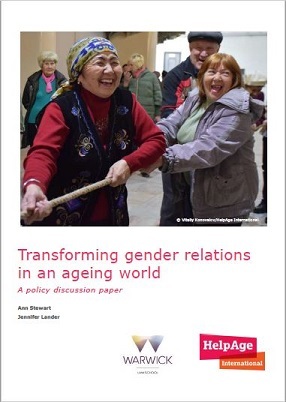 Gender relations in older age will be improved by reducing inequalities at each stage of people’s lives. Experts from the University of Warwick have contributed to new thinking on tackling inequalities associated with older age in lower and middle income countries. Research by Professor Ann Stewart of Warwick Law School, supported by Dr Jennifer Lander (now at De Montfort University) into the interaction between gender and ageing in rural Kenya underpins a new discussion paper published jointly by Professor Stewart and Dr Lander in conjunction with HelpAge International as a resource for policymakers, international NGOs, national and local governments, and older people themselves. Professor Stewart’s case study, supported by the Leverhulme Trust, focused on customary systems of support for older women in rural Kenya. Her wider research found that, while increased prosperity leads to longer life expectancy, living longer brings challenges if there is no planning and support for long term care, and no focus on the rights and needs of older citizens. The research identified ageing as an issue of growing importance for international policymakers. Professor Stewart said: “We recommend that policymakers should adopt a ‘life course perspective’ – they should look at the experience and needs of those who are older now, but also look back over their lives and consider what could have been done earlier to tackle the root causes of inequality.